Bump-N-Go cylinders from Industrial Scientific simplify bump testing of gas detectors for mobile workers. Bump test or check your gas detectors on the go. Now people don’t need to choose between transporting large bottles of gas or not bump testing at all. Industrial Scientific, the global leader in gas detection, is pleased to introduce Bump-N-Go™ portable gas cylinders. Bump-N-Go cylinders are designed to simplify bump testing for mobile workers or those who do not have access to a docking station. The miniature cylinders are only 3.8 inches (97 mm) tall and provide up to 250 bump tests when using the corresponding pushbutton regulator. The cylinders have a one-year shelf life and are available for single-gas CO and H2S instruments as well as standard 4-gas (CO, H2S, O2, LEL) instruments. Bump-N-Go cylinders can be purchased individually or in a 6-pack. 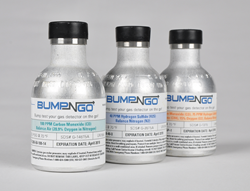 Learn more about Bump-N-Go at http://www.indsci.com/bump-n-go. About Industrial Scientific Corporation As the global leader in gas detection, Industrial Scientific provides gas detection products and services that keep workers safe in hazardous environments. The company’s 700 employees in 21 countries are committed to preserving human life, and have dedicated their careers to eliminating death on the job by the year 2050. Established in 1985 and headquartered in Pittsburgh (USA), Industrial Scientific also has operations based in Arras, France and Shanghai, China, and provides technical services to customers from local service centers around the world. Industrial Scientific is the parent company to Predictive Solutions Corporation (http://www.predictivesolutions.com). For more information, visit http://www.indsci.com.